Kerttu Niskanen, the two-time Olympic medalist in cross-country skiing, lives the life of top athlete which means high-intensity training. The training conditions and environment also mean a lot. The recovery time between training exercises and preparing for the next training session are as important as the exercise itself. 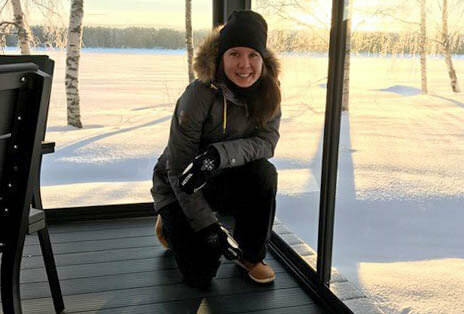 Kerttu and her partner, cross-country skier Juho Mikkonen, built a villa to be their training base in the hilly forest surroundings of Vuokatti in Finland. ”The training possibilities in Vuokatti are brilliant throughout the year. Vuokatti hill and the indoor skiing tube also provide excellent conditions for summertime training. In addition, all of the training grounds are located nearby”, Kerttu praises the training conditions of Vuokatti. The magnificent grounds of Vuokatti are highly appreciated by Kerttu and Juho. ”We tend to spend a lot of time in the forest and we enjoy it a lot”. The new Villa in Vuokatti is an important base and place of relaxation where the couple will surely spend a lot of time. The villa´s big terrace with glass walls provides plenty of additional light and living space. 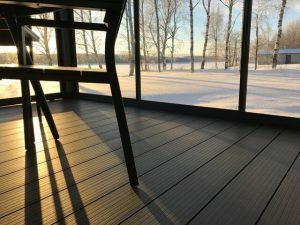 Lunawood´s Thermowood Plastic Composite was chosen for the terrace flooring. ”We wanted durable and easy care terrace decking, that’s why the selection was clear for us. Thermowood Composite is ecological and also really good-looking”, Kerttu states out the selection criteria. Kerttu knew Lunawood as a company because one of its mills is located in Iisalmi near her hometown. ”We got to know the Thermowood products and had a crush on them. We warmly recommend Lunawood’s products. We were satisfied with the delivery, installation and stylish outcome”. The skiing couple has a dream to build their own house some day. What it comes to terraces some decisions has already been made. ”No doubt that we also want Lunawood’s terraces there”, Kerttu is planning. Lunawood wishes Kerttu all the best and success for the World Cross Country Skiing Championships in Lahti and relaxing moments in the new villa and terrace! Follow our Love for the Forest story on Instagram and get inspired through Pinterest.